Got up at 6:15 a.m. today to head out to some yard sales. One in particular was in an area that we thought would be a really nice area of Greenville. Whoa! when we arrived, it was at a dumpy house and it appeared that they had saved every OLD piece of electronic equipment that they'd ever owned and had it out to try and sell. Old huge computer monitors, old old fax machine, old scanner, old telephones, boxes of electrical outlets, a few books, etc. It was sure a bunch of junk! Didn't buy anything...actually I think they'll end up having to pay somebody to haul that junk away to recycling. On the way to that yard sale, I'd seen a sign for an Estate Sale on a street where a lady had lived that I worked with. I hoped that the sale was at Nancy's house and it turned out that it was. Her three sons are preparing to sell the house and are trying to clear out the contents before putting it on the market. 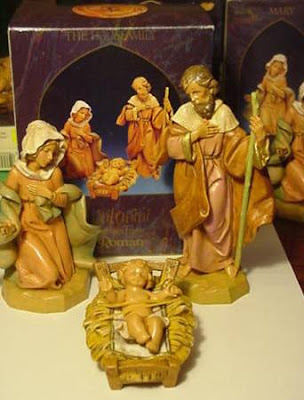 I didn't see a much I needed but a Fontanini nativity in unopened boxes caught my eye. There were 19 pieces, retail value at almost $500. and we bought it for $20. Some of the pieces I already have and will probably sell them on craigslist or ebay and can make our money back on selling those pieces. We also went to The Ham House for a good country breakfast and then this afternoon Kristy had a booksigning for her children's picture book, "Me With You." So all in all it's been a good and fun day. 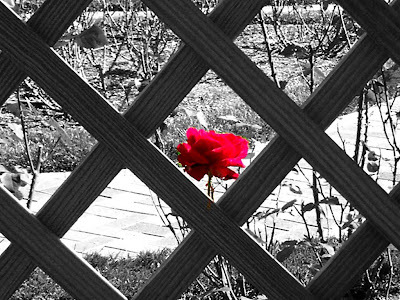 To see more Wordless Wednesday participants. Thanks again to Raechel for encouraging us to share our yard sale finds each week. 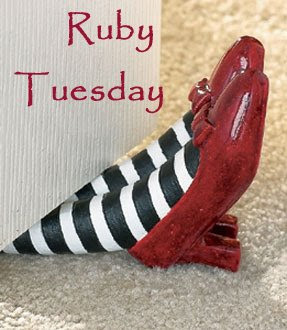 Check her blog at Finding My Feet and also check out the links at the bottom of her page for today where others link to their blog posts. It's so fun to compare our finds with everyone elses. We hit the yard sale mother-lode today. A woman and her son had obviously bought almost everything that Linens and Things had left in their store when they closed and were selling it C-H-E-A-P!!! I hope they made some money because they were practically giving stuff away (YEA! for me). A few months ago, I was in Belk when they were having a 1/2 price sale on their bed pillows. Pillows and I have a running battle because I can never find one to suit me. We have a king size bed but the particular pillow I wanted only came in double but I liked the pillow and ended up paying $45.00 for one pillow. Today at the yard sale, I found another like it for which I paid $3. Original price:$89.99 and I got it for $3. Am I happy? You bet!!! It has a suede-like cover on it and is made by Tempur-Pedic (pictured below with the cream-colored covering). I also found two Serta-Perfect king pillows for son's bed along with 7 luxurious towels. Original price on the king pillows was $39. each and we got them for $5 each. Original price on the towels was $16.99 each and we got them for $1 each. Hubby had said for a long time that we need a new toaster oven. We use our toaster oven EVERYDAY...gets a lot of use and our old one is getting pretty ratty! At the same sale, we got a Hamilton Beach Convection Toaster Oven, regular price $59.99 for $5. Mind you, all these things are new, still in the box; no dents, scratches, missing parts, etc. 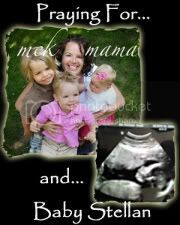 BRAND NEW!!!! Can't beat the price. A few weeks ago, I purchased a daybed with trundle and two mattresses on CraigsList. Got a steal on it but thought I wanted to cover the mattresses with some kind of topper/mattress pad. Found a twin, 2" memory foam mattress cover, regular price $99.99 and paid $5 for it. Do you see a pattern here? Almost everything there was $3, $5, or $20. For years, I have wanted a nice stainless steel trash can for my kitchen. All my appliances are stainless and wanted to match it up. I've looked at them once in Bed, Bath and Beyond and Linens and Things (pre-bankruptcy) but never felt like I could spend the kind of money they asked on a really good one. Have made do in the kitchen with just white plastic garbage cans from Wal-Mart. Guess what I got at the yard sale today? Yep, a SimpleHuman Stainless Steel can, original price $129.99 for $20. Still am not believing it! AMAZING! The two things Maggie had asked me for were the Mr. Coffee and a toaster. Again, found a B&D toaster, original price $35 for $3. Now, for the Tuck-N-Run finds of the day! We've been using a Keurig single serving coffeemaker at work for a couple of years that belonged to one of the professors. She no longer works at the university and when she left, so did her coffeemaker. So, we were thinking we would have to go out and purchase a Mr. Coffee and brew a pot everyday. There are only four of us in the department that drink coffee so we didn't really want to do that. Another good thing about a single serve is buying the pods in different flavors along with tea pods if someone preferred a cup of hot tea. Would you believe that the yard sale had several of the $169.99 PLATINUM model Keurig single serving coffeebrewers so not only did I buy one for work, I bought one for home too!!! I made off like a bandit for $20 each! If you recall, last week, I helped my niece put items out for her yard sale and remarked that I could use and would buy two of the items she was selling if they didn't sell. I got a call from her late in the day Saturday afternoon telling me she wanted to GIVE me FREE of CHARGE the two items I had talked about. One is originally a china cabinet but I am going to paint it and do my painted glass mosaic on the glass doors and use it for a bookcase. Many of my books are stored in a storage building and I want to bring them home. I have the perfect spot for it and it will look great. I am anxious to get it painted and will post my pics when it is finished. Can't beat FREE!. Dumpster diving has become my husband's new hobby. Well, not really dumpster-dumpster but trash can haunting! While out riding his bike early one morning when we were at the beach recently, he spied something that he thought I would like. Not being able to carry it while riding his bike, he came back to the house, got the car, coming home with the neatest thing again FOR FREE from the trash. I have no idea why anyone would have thrown it out, but they did and we made a haul...love my new wicker plant stand! Don't you? Wordless Wednesday - "and I Love You"
Thanks to Raechel at "Finding My Feet" for encouraging us to post our yard sale finds each week. I love reading about yours and hope you enjoy mine. I had a ball today. I was up this morning at 5:35 a.m. and out the door at 5:55 a.m. to help my niece, a cancer patient, with her yard sale. Actually, I just helped put the "goodies" out and then left and shopped several more yard sales. What a fun morning. Niece had country ham biscuits and hot coffee so we ate before we got to work. Lisa had colon cancer, diagnosed last October and two subsequent surgeries, an infection and weeks in the hospital. She has had 13 chemo treatments and has amazed us all with her stamina. She is a single woman and her own sole means of support so this year has been particularly difficult. She was recently told that, although the colon is clear of cancer, she has more cancer in the thorax region. She will find out next week when she will have a biopsy on it so that she can have more treatments, either chemo, radiation or both. We are very hopeful of a complete cure. Several friends are helping her with the yard sale today so she is in good hands without my help for the actual sale. Now to my bargains of the day: Nothing gets me going like a BIG cuppa coffee in the morning; and I do mean a BIG mug. 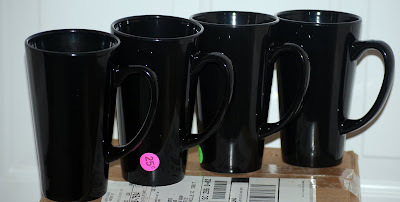 One of my favorite finds of the day was a set of 4 coffee mugs that are big enough to suit my coffee needs. They also suited my budget at .25 each. I have gotten to be a real sucker for picture frames and don't really have a plan but I can't resist the unusual frames and at such a great price! Two frames are PB plus they've never been used (not that that matters with a picture frame). One of the PB frames was $1 and the shadowbox with three picture spaces in the mat was $2. The remaining frames were $1 each. 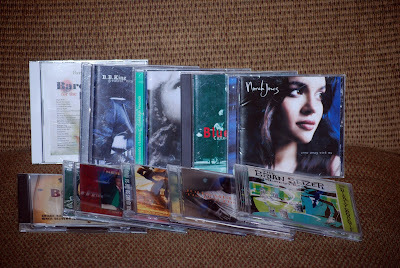 Today, Tim went to yard sales with me and I'm glad because he went through a box of CDs at $1 each and found 10 that we probably would never buy at full price but love the music and will get way more enjoyment than $1 worth :-). When we were at the beach last week, we searched and searched the beach for a sand dollar. Granddaughter Kate had seen one for sale in a shop for $1 and wanted it so badly. We thought we could find one but alas, nothing but broken ones were on the beach. Imagine my surprise when I found a little basket with about 20 sanddollars in it for .10 cents each. 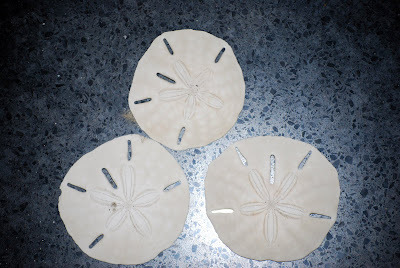 :-) Now Kate will have her sanddollar, already dried and bleached and ready for her...and at a bargain price. Can't wait to see her to give it to her! And last but not least...the TUCK and RUN deal...As I've already said, I have become a real sucker for photo frames. As you know if you regularly read my blog, my husband recently bought me a new camera. I've been snapping photos like a mad woman and especially on our beach trip last week. Thus, I have lots of photos to frame. This morning, my eye immediately went to three black framed photos, matted and ready to hang (except I'll put my own photos in). I have some photos that I got printed free just by registering at Walgreen's online so I'm set to go. I'll post my photos in the frames later but wanted to show my deal of the day. What a blessing this summer has been. First, Tim and I spent a week in Destin, Florida in May. May is such a beautiful time to go to Destin. The weather was wonderful...hot enough but not too hot. We love Destin because of the beautiful white sugar sand and the aqua blue water and this year was no exception. Each year, we love Destin more. The Magnolia House at Destin Pointe is a great place to stay and again, May is the perfect time. Many of the snowbirds have left for their homes in the north and lots of the Pointe is deserted. It is quiet and so peaceful. It's a great place to read a couple of good books while soaking up some vitamin D (errr, uh, I mean slathering on the sunblock and sitting under an umbrella). Last week, all the family with the exception of Maggie, traveled to Sunset Beach, NC. Again it was a wonderful week of relaxing, playing with the grandchildren, having scrabble and Wii bowling tournaments, and eating some great seafood at The Hut in Calabash and later eating David's chicken bog and Demps' Low Country boil. YUM! Drew, our fisherman extraordinaire, lived on the dock. Meg loved playing in the sand, often burying herself from the waist down while Duncan and Kate loved playing in the tide pools. As the week went on, they got braver and braver in the deeper water, much to my consternation. Krissy spent part of the week in Florence finishing up her summer job, then came down to spend time with us at the beach before heading off to Tigertown where she'll be a freshman in pre-med. Drew on the dock... I spent some time rocking, some time reading, some time playing, and some time sleeping along with eating and being the official vacation photographer. 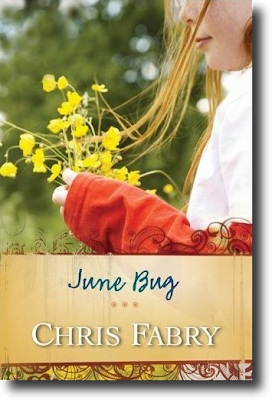 I read a wonderful book, "June Bug" by Chris Fabry. It is one that I will want to read again and that's saying a lot for me because the Mitford series is the only series I've ever read twice. All in all, I'd say that this has been a summer to remember. Now for some pics from the Summer of '09.